Walking through Hyde Park, Giles and I came across the set of a Bollywood movie. They were in the process of filming a dance fight scene... and there really are not enough of those in movies these days (think Beat Street and West Side Story). We did have to hang around for a while (about 5 mins) to get the video but it was entertaining to watch it. There was also a very tall Indian woman who looked like an actress. She walks in front of my camera as the fake fight is progressing. On a fabulous walk through the Sydney Botanic Gardens and around The Domain and Circular Quay, we saw why this is a pretty city. I don't agree with the Witlams , I think she has a nice soul too. There are thousands of fruit bats that live in the gardens. They spend all their daylight hours there and then fly off in to the suburbs to feed off fruit trees and flowers. At sunset, you can see them leaving the gardens all at once as a constant trickle heading south west across the sky. The botanic gardens has a rare and endangered plants area near a slightly more defensive succulent garden. Both were beautiful. It was nice to visit many succulents like the ones I grew so successfully in frosty Canberra. If you've read my post about The Bad Tree, you will be happy to know that there are pines of the same species wandering freely in the gardens. These pines are Wollemi pines and are as old as the dinosaurs. It's a nice idea to walk by plants that dinosaurs once walked by. We stopped for lunch and a nice rose at the Opera Bar. Giles had the veal and I had my first order of fish and chips since coming to Sydney. The food was not bad at all. The sun burnt us a little. After this we continued on to the Rocks and saw the dig site they have unearthed under a 1970s carpark. This is the view of the city of Sydney that I get when I leave work around 6ish. Hyde Park is full of interesting sites and sounds during all hours of the day. On Thursday night, Giles and I met a friendly group including Kaos who were quite talented at playing with fire. Every day as I walk through Darling Harbour on the way home, I wonder what this poor tree did to deserve to be locked up. Does the tree get visitors? Today I stopped and looked around at the short journey from our common front door, to the lift and to our apartment. You really have to visit to see it for yourself. It's funky. I am not sure why the lift foyer lights at work are orange but I'll put it down to the only big event happening this week - pay day. 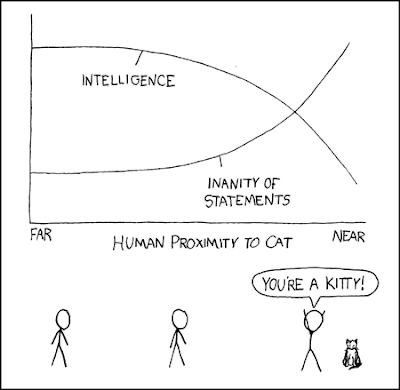 XKCD is my favourite web comic at the mo. Giles introduced me to it about a month ago. The 75th Anniversary of the opening of the Sydney Harbour Bridge was celebrated today. All lanes were closed and the coat hanger was open to the public to walk across. If you have ever driven across the icon, then you will understand the significances of people being allowed to walk casually along her lanes, north to south. Giles and I got the train from Central to North Sydney and walked down the middle of the Princess Highway towards the bridge. There were more people than you can possibly imagine streaming constantly across all lanes of the Sydney Harbour Bridge from 10am until late in to the evening. Giles and I walked at our pre-booked time of 2-2:30PM. I have traveled across the Sydney Harbour Bridge many times by car and train and always looked up with awe. Having the opportunity to slowly stroll across the drive deck and gaze up at her truly was a memorable experience for me. It was amazing to see the whole city surrounding the bridge closed down. People were walking in the middle of normally busy streets. Everyone was smiling. Jen + Andrew were married the day before the wedding party. It was nice to see them so happy and to catch up with friends like Dean, Sharon + Cass that I had not see or spoken to in months. Now say "Jen and Andrew"